Black Friday is past, of course, but it's not my thing anyway. I think I've only gone out for it a few times in my life because I don't like all of the traffic or the crowds. My holiday gift shopping mostly happens online. I like to comparison shop and take my time, putting plenty of thought into how I spend our money and finding the elusive "perfect" gift. When I do go out to stores, I'm likely to put a few things in my cart during an hour's time and then put most or all back before leaving. As you could probably guess, I am also a solo shopper. No shopping with girlfriends for me. I would drive them crazy. Especially my impulse-buying friends and my mother. My husband, however, is my opposite. He loves the crowds and the busy-ness and has no problem making decisions. And because of his work, he thrives in the odd hours. I do NOT. So, while I slept, Papa Bear went out at 4 a.m. and scored some awesome deals. They are all for our home. His best buy was a GE Profile Dishwasher for $299! The regular price is $899! We were originally going to get another Maytag because of the recall rebate but he saw that this was an even better deal. He also got a GE Microwave for $99. We had bought a Samsung from Lowe's but once I read the reviews on it, we decided to return it. And because he heard me mention that we could probably use a new toaster, he bought a shiny 4-slicer for $30. He had noticed a woman with "lots of kids" packing one around and asked her where she found it. I know, a toaster is a rather mundane thing. 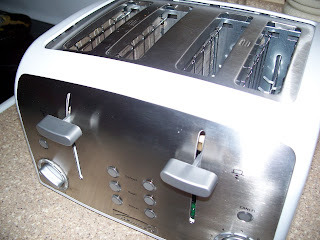 But my boys think it's cool that you can toast four slices at once and the buttons and dials light up. So, although I still don't have any Christmas shopping done, "we" did take advantage of the Black Friday sales. And my husband proved to me, once again, why he is so awesome. Are you a Black Friday or a Cyber Monday shopper? What amazing deals did you take advantage of this past weekend?